Every year the Club participates in many programs and projects as a service to its members and the community. 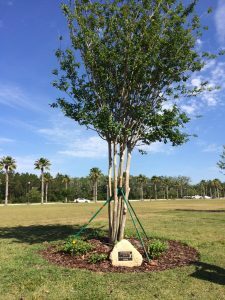 Arbor Day: The Garden Club celebrates Florida Arbor Day in May by planting a tree within the community. This is also an opportunity for the Club to recognize any members who have passed away the previous year. A plaque is placed near the tree listing those members being remembered. Blue Star Memorial Marker: This program was started by the National Garden Club in 1945 to honor WW II veterans. This Memorial Marker, the first in Flagler County, was dedicated on Nov. 9, 2006 and is located at Bull Dog Dr. and SR 100. It stands as a tribute to members of the Armed Forces who have defended the USA. It is lovingly maintained by members of the Garden Club. Camp Wekiva: Every summer, the Garden Club sponsors 2 youngsters to the FFGC’s Wekiva Youth Camp for a week of fun and an opportunity to learn about nature. Online signup for Camp Wekiva. 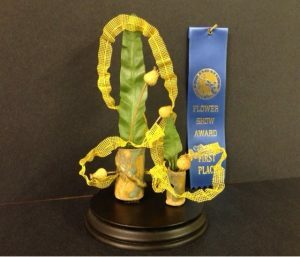 Plants for Pleasure: Since 1999, Club members have brought to the Nov. meeting festively wrapped house plants which are then delivered to members who are ill, residents of the community that are in hospice care or residing in local nursing homes. 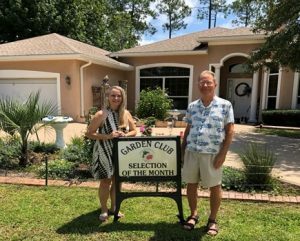 Selection of the Month: Designation of a home with outstanding landscaping has been a key program for the Garden Club since 1975. Recognition is provided to the homeowner(s) by placing a “Selection of the Month” sign on their front lawn, a photo album of their property and introduction to the membership at that month’s meeting.